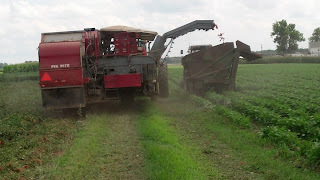 The first couple of weeks in August, our farm is generally running full tilt whereas grain farmers usually get some lag time, vegetable growers do not. We grew 100 acres of Roma tomatoes this year. 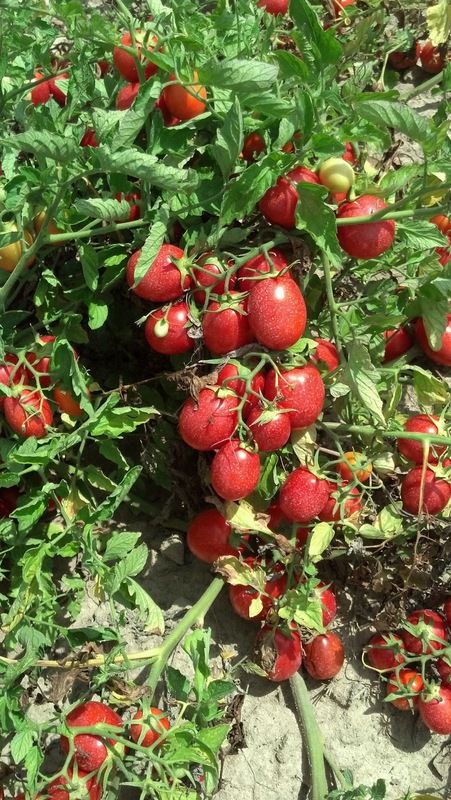 We started growing tomatoes 10 or so years ago as a means to diversify the farm and to add value to each acre of farmland we farm. Fruits and vegetables are a higher value crop with greater risk than grains. They are also more time consuming to manage and have a shorter growing season than grains. 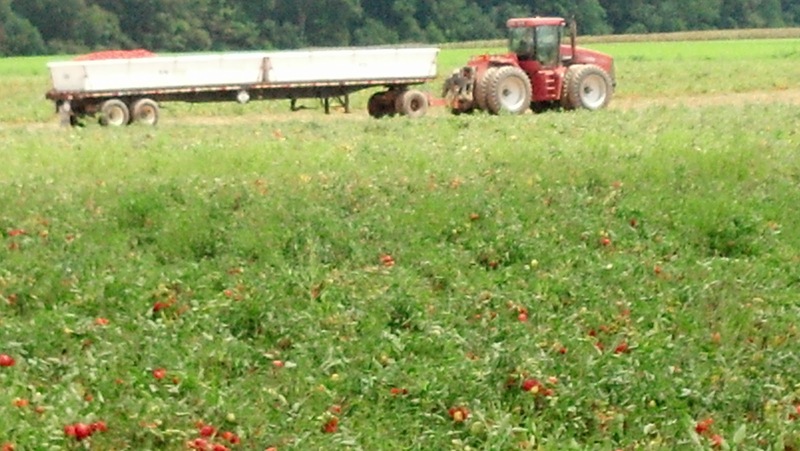 Our tomatoes are processing tomatoes so they are field grown not staked like most fresh market tomatoes. They are firm and meaty, not juicy. The cannery that we grow for tells us which varieties of Roma's they want us to plant because they use specific varieties for specific products. The variety that goes into stewed tomatoes may be different than the variety that makes their pizza sauce. They are also mechanically harvested rather than hand picked like fresh market tomatoes. The harvester is pulled by a tractor. The machine pulls the vines out of the ground, removing the tomatoes onto a conveyor belt while the vines gets dumped back out on the ground. The conveyor belt is on a platform where 4 crew members remove green tomatoes, rocks and other debris. 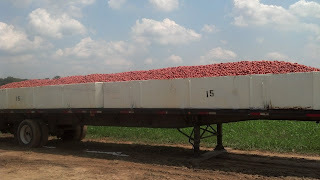 The conveyor then lifts the tomatoes up a shoot and dumps them into a trailer. Here is a video of the harvest process. This picture show the harvester "opening" the field, meaning we're just starting the edges so a small cart is used to haul these first few rounds of tomatoes. The field that the cart is driving in is our green bean field. they will be ready later this month. These white trailers are what runs along side the harvester receiving the tomatoes once the field had been "opened up". 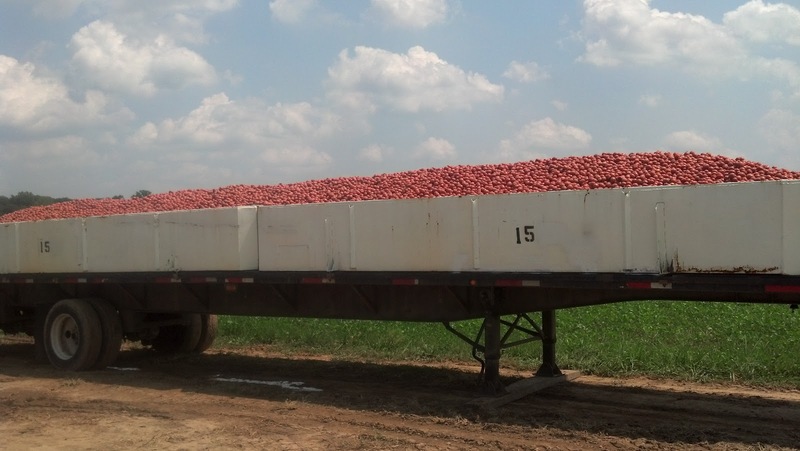 When full, these trailers hold 22 tons of tomatoes. We are currently averaging 44 tons per acre. It is one of our best yielding and highest quality crop ever. The cannery will tell us how many trailer loads of tomatoes they can take each day. Typically, we are picking 18 loads per day. 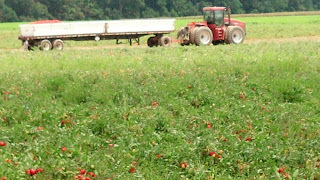 If you do the math, at 22 tons per load, thats nearly 400 tons of tomatoes a day. These trailers are hauled by truckers up to the cannery. The trailers are flooded with water and then poured out of the trailers so that the tomatoes don't bruise. They are immediately processed into whatever product the cannery is canning that day. I'm happy to tell you that most canned vegetables are really quite fresh. They are processed and canned within 24 hours of leaving the farm. Especially when fruits and vegetables are not in season, canned versions are a nutritious and economical alternative. We are about half way through our 100 acres as of today. Last year we were recognized by the cannery as one of their top growers. We averaged 36 tons per acre in 2011. 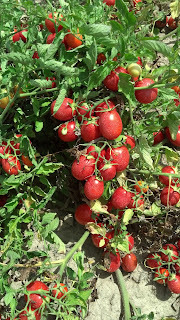 Looks like 2012 which be another spectacular tomatoe season!